One windy day my darling granddaughter asked me to make her a scarf, and one for her sister. So how can a grandma resist that kind of request? I certainly could not! Wanting something simple yet still pretty I decided on basics. By using the basic stitches, you get a natural wavy look to your rows and yet, it is so simple to work up you’ll be surprised how fast you can make these smaller scarves. Scrap yarn from your stash (scarf in main image used Red Heart Fiesta). Yarn should be smooth and weight no thicker than worsted. For beginners, this scarf will help you practice your basic crochet stitches and for experienced crocheters, you’ll have opportunity to really play with color combinations from your scraps to come up with fun scarves. 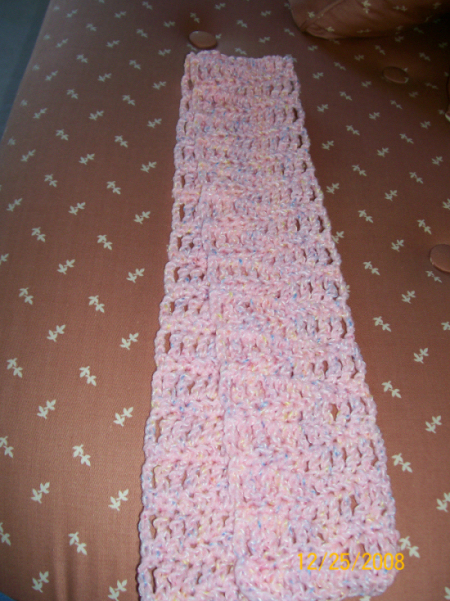 When I worked the above scarf for my granddaughter who was about to turn two, I used just one color. 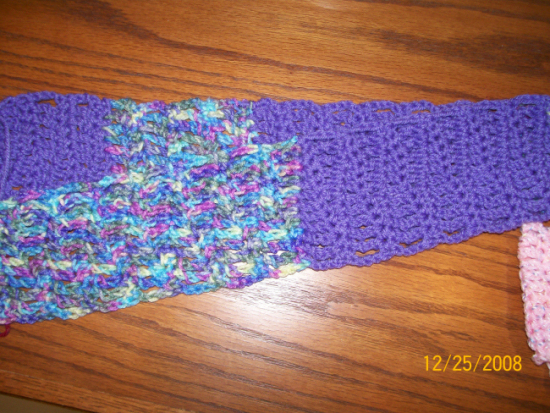 When I worked the scarf for my older granddaughter, I used Red Heart Super Saver in Lavender and Red Heart Monet. I simply worked the rows until I felt like changing color so there were no set number of rows for each color. If you wish you can easily adapt it to be an adult size by working it with a larger hook (to make it wider than four inches) or by working it holding two strands of yarn together and making it as long as you wish. Due to the nature of the stitches making the wavy look I would avoid textured or bulky yarns. Weave in ends. If desired, add fringe or corner tassles for ildren or adult sizes. Fringe or tassles not recommended for younger children. Wash and block as needed.